I decided to start posting useful tips for my readers. These are just simple things that I normally practice when traveling here in Philippines. I always travel on what I like to call a 'student budget', which means I don't spend like I'm earning money! If you can't decide where to eat, do not trust your instinct. Instead, check out the place with the most customers. Locals always know where the best food is. Always bring your own water bottle to keep yourself hydrated. Most of time, if you run out, you can have them refilled in restaurants or canteens where you just dined. That saves you some money and a trip to the store. When eating fastfood, always have your drink to-go, so you don't need to ask for a cup cover when you decide to bring it with you when you're finished eating. Got more tips for those who wish to Travel to Philippines? Post them here! 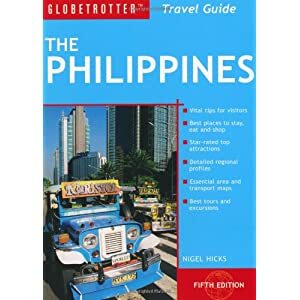 Globetrotter - The Philippines Travel Guide (Nigel Hicks) 5th edition (October 19, 2010).